Taste of Washington is one of our iconic food and wine events here in the Northwest. Back for its 18th year, this year’s event is bigger and better than ever so make sure to mark your calendars for Saturday, March 28th and Sunday, March 29th. On Saturday I will be emceeing at the Alaska Airlines Chefs Stage from 2:15 PM to 5:00 PM. It’s a great line up of chefs who will be sharing how to make their signature dishes and demonstrating exciting techniques. Looking for a delicious and fun weekend getaway fun for the whole family? Then head to Ocean Shores’ Razor Clam Festival and Seafood Extravaganza Friday, March 20th to Sunday the 22nd. This clam-tastic weekend features all sorts of family fun events, like clam shovel decorating, mechanical shark rides, and chowder tasting where you can cast your vote for People’s Choice! But make sure you don’t miss the chowder cook offs – both chefs and amateurs battle it out with their best chowders for big bragging rights. Who will be best on the beach this year? Razor clams are a definite northwest delicacy. If you want to try your hand and “shovel,” be sure to check out the Washington department of Fish and Wildlife website for dig info. Don’t forget your clam license, fishing or waterproof gloves and boots. And remember: Never ever turn your back to the surf! Once you’ve reached your razor clam limits, check out this video that my friend Scott Surdyke and I made on how to clean them properly. And for a super tasty way of cooking this bi-valve, try our recipe for our Clam-tastic Razor Clam Fritters with my Rock-the-World Tartar Sauce below. Drain the clams and save any juice for use in recipe. In a large bowl combine the Krusteaz, corn meal, baking powder, lemon pepper, zest, salt and pepper. Stir in the garlic, clam nectar/juice, beer and eggs to combine. Then fold in the celery, corn, green onions, bell pepper and drained clams. Heat 2-inches of Crisco in a large cast iron skilled till hot – about 375 degrees. Scoop out fritters a few at time – I use a 1/4 cup measure – they should be kind of spread out and not too thick. Fry on first side till golden and then flip over. Continue frying till golden and cooked through. Drain on paper towels. Cook fritters in batches being sure oil stays hot. Keep fritters warm in a 300 degree oven on a rack if needed – but they are best served right away – the fritter cook will just have to keep cooking! Serve with Rock the World Tartar Sauce and fresh lemons. Recipe by Scott Surdyke and Kathy Casey. In a medium bowl, mix all the ingredients. 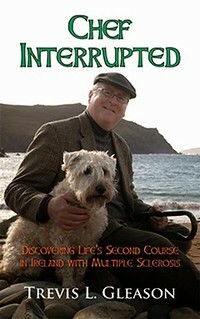 Trevis Gleason’s “Chef Interupted: Discovering Life’s Second Course in Ireland with Multiple Sclerosis” is a very well written, funny, honest and inspirational book. I urge you to pick up a copy. Trevis was a chef and culinary heavy-hitter when he was diagnosed with MS at the young age of 35. This memoir is the story of his life after that diagnosis – or as he says “life after the fall”. He fulfills a long-time dream and moves to Ireland, rents a picturesque cottage, adopts his sweet dog Sadie and makes the decision not to let his disease get the better of him. These moving stories are punctuated with delicious sounding recipes – many Irish. White Soda Bread and Sticky Toffee Pudding are favorites! Trevis reminds us all how true passion can never be taken. The book is on sale NOW and available on Amazon. As far as trends go, fresh ginger is Hot, Hot, Hot! It’s everywhere on menus these days from signature cocktails to entrees to desserts! And no wonder! Not only is fresh ginger spicy, aromatic, and so tasty, it is incredibly good for you. Ginger has been used for ages as an anti-inflammatory and is a well-known cure for symptoms of motion as well as morning sickness. And next time you have a cold or the flu, try some hot ginger tea. It’s an age-old remedy that helps boost your immune system. There are a ton of great uses for ginger in drinks. I like steeping it in some simple syrup to add that special zing and spice to drinks. And of course ginger beer is the latest darling in the whole Modern Mule Cocktail Craze – and easy to make, vodka, squeeze of lime, and a great ginger beer, like Rachel’s Ginger Beer – a local fave! Hands of fresh ginger are easy to peel using a small spoon! Want to know my ginger peeling trick – it’s like magic! Peeling ginger roots with the side of a spoon – the brown skin rubs right off, and you won’t waste too much of the great flavorful inside. It’s that easy. And one of my favorite and easy Pacific Northwest-inspired meals is fresh local clams or mussels steamed with lots of ginger, garlic and lemon grass with a dash of hot chili paste and coconut milk. I’ve got a great recipe for you below! One of the many basil varieties, Thai basil is often described as having a spicier fragrance than sweet basil. I’ve combined it with ginger, lemongrass, and steamed mussels for a dish that is full of aromatic characteristics and brothy richness. In a large soup pot or Dutch oven, heat the oil over medium heat until hot. Add the ginger, garlic, red pepper flakes, and lemongrass and cook, stirring often, for about 30 seconds; do not let the mixture burn. 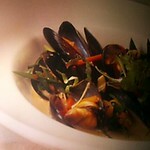 Add the coconut milk, fish sauce, soy sauce, Thai basil, lime juice, mussels, carrots, red peppers, and green onions. Bring to a boil, and cover immediately. Steam the mussels, covered, for 3 to 5 minutes, or until the mussels just open. Immediately remove from heat. With a slotted spoon, divide the mussels (discard any that are unopened) and vegetables among bowls and pour the broth over them. Sprinkle with cilantro and serve immediately. Chef’s Tips: If Thai basil is not available, substitute any fresh basil.